The snow is still deep in Central Park, but winter seems to be easing its grip on the city; the banks along the street are beginning to recede leaving a trail of gritty treasure behind. Which means (if we’re lucky!) that spring is on its way and it’s time to get as many of the the cold weather recipes I’ve been thinking of out of my system – including this Butternut Squash & Gruyere Galette. This recipe for a gratin written by Kimberley Hasselbrink was my introduction to the combination of butternut squash, Gruyere and toasted hazelnuts and quickly became a favorite. The rich nutty flavor of the cheese emphasized by the hazelnuts and paired with the deep roasted flavor of the caramelized onions and butternut squash is amazing. I’ve been focused on improving my pie crust game in 2015 and combining this filling with a whole wheat crust seemed like a match made in heaven. I love the toasty flavor of the whole wheat, and the rustic appearance of a galette (or crostata if you prefer) fits beautifully with this earthy, but elegant dish. Dice the cold unsalted butter into small cubes and measure the water. Replace both in the refrigerator while you set up and measure the remaining ingredients. In the bowl of a food processor fitted with a steel blade place the whole wheat flour and kosher salt. Pulse a few times to mix. Add the diced, cold butter to the food processor and toss gently in the flour to coat. Watch your fingers! Replace the cover and pulse about 10-15 times until the butter is the size of peas and evenly distributed in the flour. Lastly, slowly pour the ice water through the feed tube of the processor while pulsing the blade. As soon as the dough begins to pull together into a crumbly ball, stop pulsing the processor. Turn the pieces of dough out onto a piece of plastic wrap and use the wrap to press into a single flat disc. Refrigerate the dough for at least an hour until it becomes firm. Pre heat the oven to 325 degrees F.
While the dough chills, peel the butternut squash and cut in half lengthwise. Scoop out the seeds and discard (or keep if you want to toast them!) Slice both halves into semi-circles about 1/3 inch wide. Place the butternut squash pieces on a baking sheet lined with parchment paper and toss with the olive oil, apple cider vinegar, kosher salt and black pepper. Make sure the pieces are evenly coated and have space on the baking sheet. Bake for 20 minutes at 325 degrees F turning the pieces over halfway through. Peel and slice the onions into thin rings or half-moons. Melt 2 tablespoons of butter in a medium sauté pan over very low heat and cook the onions for 20-25 minutes until they soften and caramelize, stirring occasionally. Toast the whole hazelnuts for 3-5 minutes in a small dry sauté pan. Keep a close watch on the nuts; shimmy the pan periodically to turn and prevent them from burning. Allow to cool and then very roughly chop to your taste. Grate or chop the gruyere. To assemble, roll the chilled dough out on a lightly floured surface to about 1/4 inch thick and 7-8 inches in diameter. Place the dough on a parchment paper lined baking sheet and layer the gruyere, roasted butternut squash, caramelized onions, toasted hazelnuts in the middle leaving a 1 – 1 ½ inch border. Sprinkle the layers with the fresh thyme leaves. Fold a section of the dough border up to partially cover the filling and overlapping the extra to form pleats. Press the folds gently together and brush with the beaten egg. Bake at 400 degrees F for 30-40 minutes, rotating the baking sheet halfway through the cooking time, until the crust is golden and the butternut squash is tender. Inspired by and partially adapted from Butternut Squash Gratin by Kimberley Hasselbrink for Etsy. Yes, with a little organization. For the pastry I used a 6 cup food processor (a large bowl and a pastry cutter, or even two butter knives will work too), a rolling pin, and measuring cups and spoons. For the filling and to finish the galette I used a large cutting board, chef’s knife, medium sauté pan, two baking sheets, a vegetable peeler, and wooden spatula. Parchment paper is also super helpful with clean up, or if you want to re-use a baking sheet. I’d like to pretend that I sat down very genteelly and had a piece of Butternut Squash & Gruyere Galette with a beautiful salad and a glass of sauvignon blanc like a grown-up. But really midway through taking the photos for this post I couldn’t resist the warm toasty whole wheat pastry wrapped around the mellow squash and caramelized onions. So, there I was standing over the table with a wedge of galette in one hand and the camera in the other. If you were here when it came out of the oven you wouldn’t blame me – I hope! This reheats in the oven nicely, so if there happen to be leftovers you’ll still be able to enjoy them the next day. The Set-up: Ina and Chef Joe Realmuto have offered to help make dinner for the East Hampton volunteer firefighters. 0:42 – Ina is starting us off with Pear and Cranberry Crostata which she chose because it’s served room temperature, can be easily transported and is “absolutely delicious.” Good call on all three. 1:36 – I kind of assumed that crostata was basically a flatter version of a pie, but I notice that Ina isn’t putting any spices in with the diced pears, just a little orange zest. 2:05 – Pastry time, this recipe is a little different than the one she recommended for pie – it’s butter only, no vegetable shortening – and seems a bit softer. 3:28 – A quick intro to the East Hampton Volunteer Fire Department (est. 1975), so we know why this dinner is so important. 5:52 – These look seriously delicious and I can tell already that this is the recipe I want to make. 6:39 – I’m watching Ina intently as she finishes the final assembly – especially the crust folding technique – I think this maybe where the magic happens. 10:14 – Ina has rolled up to the EHVFD in an emergency vehicle of her own – emergency dessert. 11:23 – We get a little overview of the preparations underway, buffet tables, grill assembly, and Ina’s partner in crime: Chef Joe Realmuto. 12:45 – Ina heads upstairs to cook with Sandy, mastermind of Sandy’s Potato Salad, and Ina is put to work chopping hard boiled eggs. 13:16 – Sandy tells Ina that this is an old fashioned Southern recipe from her family tradition and I believe it – any mayonnaise based salad that also calls for pickle relish has got to be straight off the picnic table. 14:35 – Ina and Sandy have a heart to heart about how cooking is only kind of a science, since even the same ingredients vary in flavor. True story, sometimes you do everything the same and it just turns out differently! 20:34 – We’re outside at the giant grills set up for Chef Realmuto’s ribs which start with a dry rub of paprika, salt, sugar, ground mustard, chili powder, cumin, black pepper, garlic powder, and cayenne. Mike is a huge barbecue aficionado I wonder if he would approve of this recipe? 21:53 – Step Two of the process involves a “Texas mop”, a term I’ve never heard before, and it looks like a miniature version of a rope mop used for floors, except this one is used to baste the ribs every half hour. 22:15 – A little research tells me that “Texas mop” could also be referring to the basting sauce itself. 26:36 – Over to Ina who is making Grilled Bread with Prosciutto as an appetizer while Joe sets up giant platters of ribs. 27:50 – Yum. Ina is used smoked mozzarella on top of the prosciutto – I love smoked cheeses. My stomach is growling. 28:21 – Training is over and the buffet table is laden with all sorts of salads including Sandy’s Potato Salad, of course. 29:32 – The crostata is served and the cooking team celebrates with a round of high-fives! I feel like crostatas might really be my jam. #sorrynotsorry in advance for the influx of crostata recipes I’ll be posting. I love how involved Ina is with her local community – I swear she’s always volunteering or donating her time. 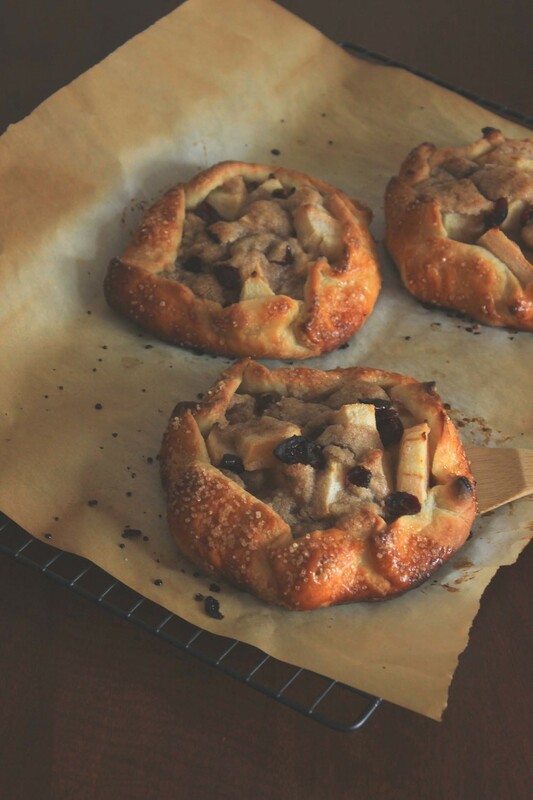 Dough – I’m trying to reach some level of comfort with pie crust and after my last attempt with Deep Dish Apple Pie where the dough was too dry I was hyperaware of adding enough water. I think I actually overdid it since the result was pretty sticky, but it seemed a little more forgiving once a fair amount of additional flour was incorporated during the rolling out process. I noticed that because the dough was a little soft that my crostata edges were prone to falling down, but I have confidence that one of these days I’ll get it right! Fruit – The original recipe called for “big chunks” of pear, but the ones I was had were a little under-ripe and since I was making mini versions I cut them a little smaller. This ended up being just perfect – the fruit was definitely cooked, but still firm pieces. I’d love to try this recipe again with fresh cranberries since the dried ones ended up a little dark and I don’t know how much of the flavor came through. I also forgot the orange zest, but it didn’t seem to matter much. Assembly – I cut this recipe in half and then made three mini crostatas instead of one medium sized one. All the proportions still worked perfectly and as I was finishing the assembly process I decided to brush them with egg wash and sprinkle a little turbinado sugar – all good choices that I’d recommend! I put these mini Pear and Cranberry Crostatas out as a mid-afternoon snack for some friends and when it was time to go there was just one lonely quarter leftover. Shockingly, it took zero convincing to get someone to help out with that last piece. I personally love the sweetness of the pears with the tart cranberries and how the crust gets beautifully crisp; which means these can be eaten “politely” with a fork or just picked right up like a slice of pizza. I also have full leave from Mike to make these anytime. Color me a crostata convert.